Our prep chiefs roll the veggie rolls, carefully stuff the Rangoon, and hand fold the Royal Shrimp every day. That's right, all of our starter dishes are hand-made right here on premises. Mixed vegetables and glass noodles wrapped in flour paper, deep fried, served with sweet and sour sauce. Tofu (soy bean curd) deep fried, served with sweet and sour sauce, topped with chili and ground peanut. Thai style fried sweet potato dipped in coconut milk and tempura served with tangy peanut sauce. 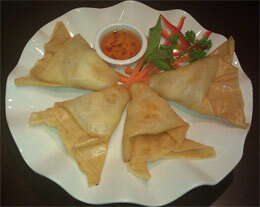 Cream cheese and imitation crab meat folded in wonton paper and deep fried, served with sweet and sour sauce. 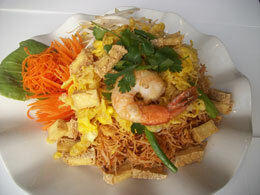 Rice paper, wrapped around shrimp (or tofu), vegetables, and thin rice noodles, served with sweet and sour sauce and peanut sauce on the side. 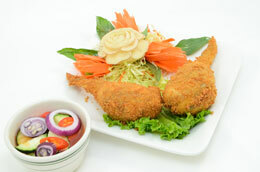 Deep fried chicken wings stuffed with vegetables, pork, and noodles, serve with sweet cucumber salad. Ground chicken and pork, added to shrimp, folded into flour paper and deep fried, served with sweet and sour sauce. Deep fried calamari in light batter, served with sweet and sour sauce. 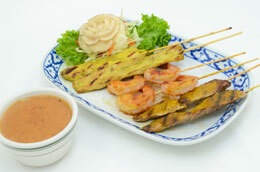 Strips of chicken breast skewered and marinated in coconut milk, a medley of spices, grilled, and served with cucumber salad and peanut sauce. 3 Crab Rangoons, 3 Veggie Rolls, 3 Sweet potato, 3 Thai toasts and Mee Krob.